NILE C, KINNICK 5024 HAMILTON OMAHA. 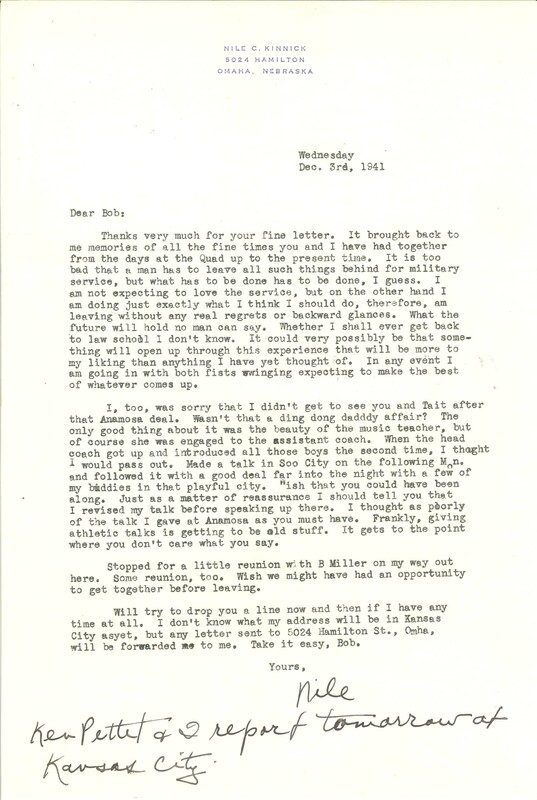 NEBRASKA Wednesday Dec. 3rd, 1941 Dear Bob: Thanks very much for your fine letter. It brought back to me memories of all the fine times you and I have had together from the days at the Quad up to the present time. It is too bad that a man has to leave all such things behind for military service, but what has to be done has to be done, I guess. I am not expecting to love the service, but on the other hand I am doing just exactly what I think I should do, therefore, am leaving without any real regrets or backward glances. What the future will hold no man can say. Whether I shall ever get back to law school I don't know. It could very possibly be that something will open up through this experience that will be more to my liking than anything I have yet thought of. In any event I am going in with both fists swinging expecting to make the best of whatever comes up. I, too, was sorry that I didn't get to see you and Tait after that Anamosa deal. Wasn't that a ding dong dadddy affair? The only good thing about it was the beauty of the music teacher, but of course she was engaged to the assistant coach. When the head coach got up and introduced all those boys the second time, I thought I would pass out. Made a talk in Soo City on the following Mon. and followed it with a good deal far into the night with a few of my buddies in that playful city. Wish that you could have been along. Just as a matter of reassurance I should tell you that I revised my talk before speaking up there. I thought as poorly of the talk I gave at Anamosa as you must have. Frankly, giving athletic talks is getting to be old stuff. It gets to the point where you don't care what you say. Stopped for a little reunion with B Miller on my way out here. Some reunion, too. Wish we might have had an opportunity to get together before leaving. Will try to drop you a line now and then if I have any time at all. I don't know what my address will be in Kansas City asyet, but any letter sent to 5024 Hamilton St., Omha, will be forwarded to me. Take it easy, Bob. Yours, Nile Ken Pettet & I report tomorrow at Kansas City.